X-rays also help us to see if there are any complications like arthritis or degenerative change that would complicate your treatment. Knowing about these complications ahead of time helps guide us to the proper treatment for you. 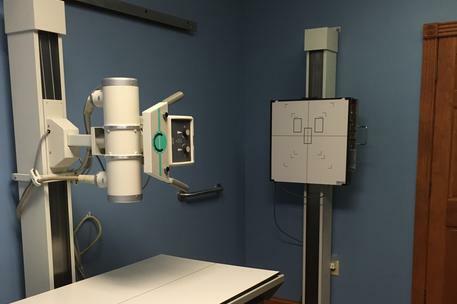 Because our X-rays are digital, we have the ability to take and review X-rays with you on the same day. This means less waiting and worrying over your results, and a less stressful path to recovery. You won’t have to worry about excessive radiation either. 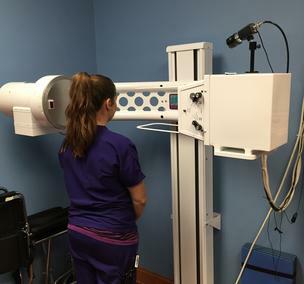 Because our X-rays use new digital technology, you receive less radiation than you would from older X-ray machines, and even less than you would get from a couple of hours in the Florida sun. Digital Motion X-ray, or DMX, is a groundbreaking imaging technology that takes video X-rays while you move, letting us see damage and injuries that are not seen by traditional X-rays, CAT scans or MRI. DMX is a traditional X-ray system coupled with new digital and optic technology that allows us to view the spine and body in real-time by taking hundreds of frames of video per second. Because most of our patients have been injured in some type of trauma such as a car crash, their symptoms usually include muscle and ligament tears. These symptoms become worse while you move, which is why DMX can be a vital tool in helping to find and treat these injuries. Most people feel pain from these injuries when they are moving, not when they are still. This means that traditional static x-rays taken while you’re holding still may not show your injuries. This is why DMX can help treat your injuries better: DMX X-rays are taken while you are moving, so they can show us both evidence of your injuries and the location of the injured or damaged ligaments from your motor vehicle accident. Unlike similar procedures like video fluoroscopy that use older technology, DMX is simple and quick to perform, allowing you to actually see and visualize your injuries right away. Our on staff Medical Doctor supervises your treatment and prescribes any medication necessary. Physical Therapy including modality treatment. Our chiropractic physicians treat your injuries with gentle, painless manipulation.